Asteroids are the key to finding the origins of our solar system. Inside of asteroids are minerals that can enable us to know what our solar system is made of. Hopefully, asteroids will give us greater clues so we can make greater conclusions. 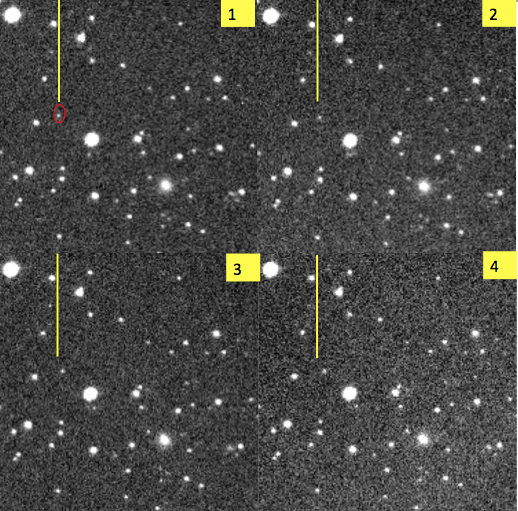 Asteroid Zoo gives citizen scientists the opportunity to catch asteroids in pictures taken from the Catalina Sky Survey that scientists might have missed. Asteroid Zoo presents the pictures in different frames numbered from 1-4. The Catalina Sky Survey took pictures of the same part of the sky but at different times. The pictures are taken about 10 minutes apart from one another to ensure the capture of an asteroid, since asteroids move while stars do not (stars are the brighter lights in the images). But why do scientists need your help? They need an extra pair of eyes to make sure they did not miss any potentially harmful asteroids in the pictures. Once you get on the website and start hunting, a tutorial is waiting for you below the “Help” tab. Unless you are an experienced Asteroid-Zoo hunter, a tutorial is a great first step for your experience so you can know exactly what you will be looking for. The welcome screen from Asteroid Zoo, showing a background image from the Catalina Sky Survey. The three classifications in Asteroid Zoo listed for the items in the picture are Asteroids, Artifacts, or Nothing. When you begin asteroid hunting, along with the transition of the frames, there is also a transitioning question: “Not visible?” This is valid when the asteroid you were tracking is no longer visible in the next frame. A possible asteroid might disappear in some frames because it might trail off the field of view. When an asteroid is not found but unusual objects in the picture are, they can be identified as Artifacts. Artifacts consist of a “star bleed”, “hot pixel/cosmic ray”, or “other.” Satellites can be confusing and ultimately classified as “other” because they have the same movement as asteroids in the sky. If there is nothing visible in the picture, then “Nothing” would be the classification for that picture. Asteroid Zoo and its many classifications should not be a challenge for you now. Below is an example of what an asteroid from Asteroid Zoo looks like in all four frames from! Note: The figure shows four different pictures from Asteroid Zoo that capture the movement of an asteroid. Looking from figure one through four, the asteroid moves towards the right. The red circle in the first frame outlines the moving asteroid. The yellow line stays in the same position so it can help you keep track of the moving asteroid. Citizen scientists vary from the curious visitor in a museum to the lawyer interested in the night sky. 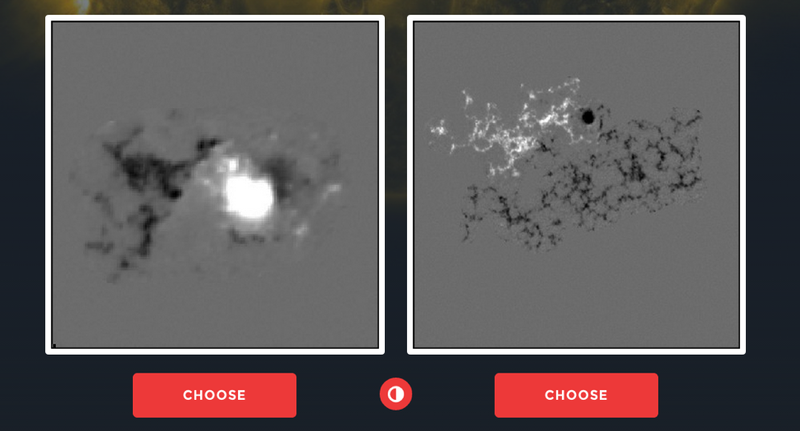 In order to connect with Zooniverse projects, citizen scientists simply need connection to the website. Then, they can explore the many projects available. There are citizen science projects ranging from astronomy to climate. By helping to solve problems and find answers, Zooniverse has expanded from a single mind getting excited about solutions to an organization promoting individual thinkers to come together and collaborate in hope of discovering a greater idea. In my previous blog post, I have discussed the basics of what sunspots are, what they look like, how they are formed, etc. For Exploring Sunspots 2.0, I will be discussing a Citizen Science Project conducted by the Sunspotter team. Have you ever wondered why scientists study sunspots? And do sunspots affect the way we live on Earth? Scientists have been studying the Sun and sunspots for quite some time. With the research and understanding about the Sun, scientists can predict how it would affect our life on Earth, especially our weather patterns. Even though the Sun is 93 million miles away from the Earth, scientists have discovered that sunspots can erupt which causes high-energy particles that put astronauts and space stations in danger. This can interrupt GPS signals and expose aircrafts to radiation. Once we understand sunspots, we are better prepared to deal with the changes that could occur in our environment because of them. One thing scientists do know about sunspots is that they occur in cycles. The amount of sunspots seen on the surface (photosphere) of the sun change from year to year. By tracking sunspots activity overtime we know that the cycle is about eleven years. Here is a graph showing the 11 year cycle and how many Sunspots have been discovered on the Sun per year. In 2009, we can see that the sunspots appearing on the Sun have decreased dramatically, but as of this year (2014) the amount of sunspots detected has reached its peak for the cycle. Citation: NOAA. 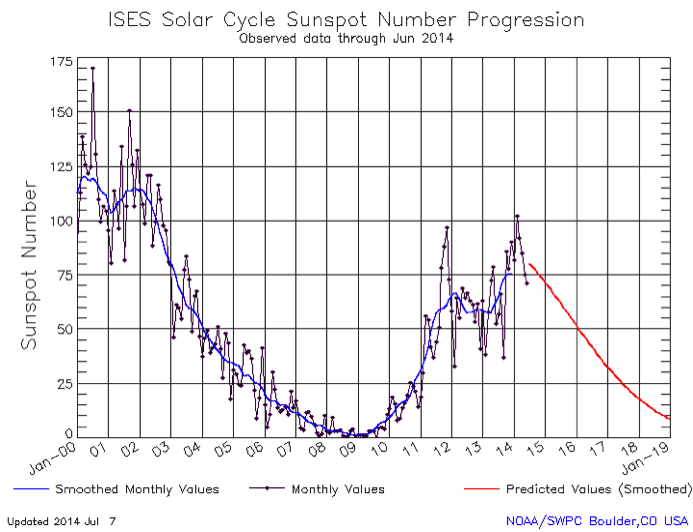 ISES Solar Cycle Sunspot Number Progression. Digital image. Solar Cycle Progression. Space Weather Prediction Center, 8 May 2009. Web. 11 July 2014. <http://www.swpc.noaa.gov/SolarCycle/>. In Sunspotters, scientists are using this data from the “Michelson Doppler Imager” (MDI) instrument, which is on the “Solar and Heliospheric Observatory” (SOHO) to study sunspots over a full solar cycle. SOHO orbits the Sun between the Sun and the Earth so it is without any interrupted views of the Sun from the Earth or moon. The MDI took data for 16 years and about 60,000 images were transferred from SOHO to Earth, unfortunately the MDI was shut down in 2011 . In Sunspotters, users are determining how complex sunspots appear to be, and the complexity deals with polarity. Magnetics have a north and south pole. Sunspots have north and south poles too, but instead they are called north and south polarities. In images of sunspots, that are on the Sunspotters website, the north polarity is shown as a white color and the south polarity is a black color. 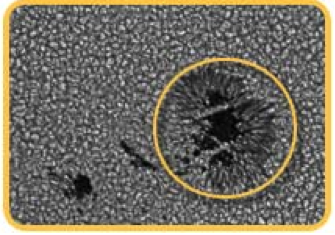 Citation of First image: Image of Sunspot. Digital image. Number of Sunspots Effect Earth’s Temperature? N.p., 24 Mar. 2010. Web. 11 July 2014. 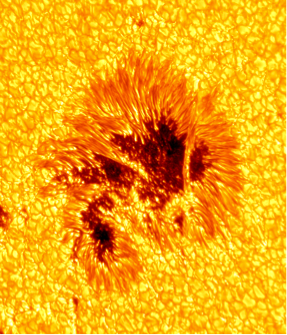 <http://peakfood.co.uk/2010/03/number-of-sunspots-effect-earths-temperature/>.Citation of Second image: Russell, Randy. Digital image. Sunspots and Magnetic Fields. Windows to the Universe, 19 Jan. 2010. Web. 11 July 2014. <http://www.windows2universe.org/sun/atmosphere/sunspot_magnetism.html>. Sunspot groups can range broadly in complexity/polarity. Images of these sunspot groups are classified from Alpha to Gamma by experts at observatories around the world. To clarify, alpha sunspots are single spots with just one polarity (North/South). Beta sunspots are a pair of spots of opposite polarity. Gamma sunspots are complex groups with uneven distribution of polarities; where they can not be classified as a bipolar sunspot group. Scientists use the Sunspotters experiment to come up with a theory of how sunspots change over time. In addition, Scientists use this experiment to quantify sunspot group complexities. This image is showing polarity from alpha to gamma sunspots and their complexities. There is also a representation of the black and white coloring of sunspots to show polarity.Citation: Sunspotter Team. Complexity. Digital image. 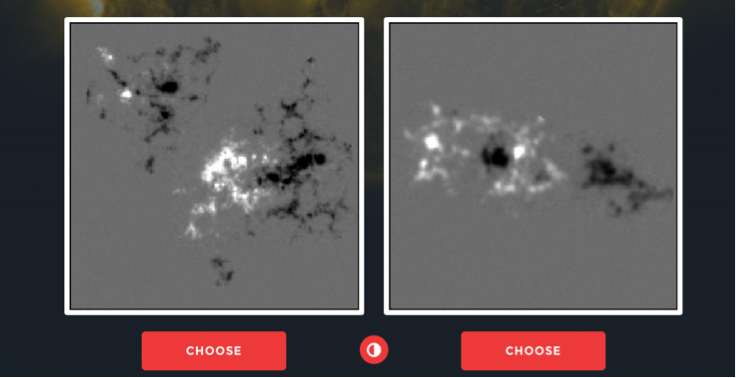 What Is Sunspot Complexity?Zooniverse, n.d. Web. 11 July 2014. <http://www.sunspotter.org/?utm_source=Zooniverse%20Home&utm_medium=Web&utm_campaign=Homepage%20Catalogue#/science/complexity>. It is extremely important to help scientists develop stronger knowledge about sunspot complexities. This will help scientists answer a few of the difficult questions that are still unanswered till this day. For an example, are sunspots born complex or do they evolve to become complex? And, do sunspot groups that are more/less complex produce more eruptions? With this experiment, Citizen Scientists are attempting to improve the accuracy of making predictions of solar eruptions. Being more knowledgeable of the sun and sunspots will help us protect humans and the Earth. You can help Citizen Scientists with their experiment by visiting the Sunspotters page. All you have to do is choose which image appears more complex! Citation: Sunspotter Team. Classify Sunspots. Digital image. Which Is More Complex? Zooniverse, n.d. Web. 11 July 2014. I hope you all enjoyed exploring teen blog posts about astronomy and science that is interesting to them. I will continue to blog on the Astro-Journalist web page so please come back and visit soon. To learn more about sunspots you can visit all of the web pages and sites I have used while exploring sunspots. Thank you once again. “Sunspots 1: A Look at Sunspots.” – Science NetLinks. N.p., n.d. Web. 09 July 2014. <http://sciencenetlinks.com/lessons/sunspots-1/>. “Sunspotter.” Sunspotter. N.p., n.d. Web. 09 July 2014. <http://blog.sunspotter.org/>. “Sunspotter.” Sunspotter. N.p., n.d. Web. 09 July 2014. <http://www.sunspotter.org/?utm_source=Zooniverse%20Home&utm_medium=Web&utm_campaign=Homepage%20Catalogue#/classify>. “Three Types of Radiation – Alpha, Beta, Gamma.” Three Types of Radiation – Alpha, Beta, Gamma. N.p., n.d. Web. 11 July 2014. <http://www.blackcatsystems.com/GM/experiments/ex7.html>. “The Sunspot Cycle.” – Windows to the Universe. N.p., n.d. Web. 11 July 2014. <http://www.windows2universe.org/sun/activity/sunspot_cycle.html>. 6. “Sunspots and Magnetic Fields.” – Windows to the Universe. N.p., n.d. Web. 11 July 2014. <http://www.windows2universe.org/sun/atmosphere/sunspot_magnetism.html>. Have you ever wondered what sunspots are, what they look like, what color they are, and how they are formed? After researching, I have discovered a very interesting experiment created by scientists called Sunspotters. The Sunspotters research team explored how you can identify what a sunspot actually is and how you can distinguish them by their complexity (Sunspotters can be found here). A screen shot from the Sunspotters project, where users compare black and white images of sunspots and choose which image is more complex. Sunspots can be exactly the way they are pronounced, they are dark spots that are located on the sun. Think of having dark circular spots on your face or body, but instead of on your body, they are on the Sun. Exploring sunspots is something I am interested in and I hope that I show you how sunspots are fascinating. Imagine, we are scientists creating robotic probes to travel to the Sun. Since the Sun is 93,000,000 million miles away it would take approximately 221 days for the US Space Shuttle to reach it. After several years of research we have found information about sunspots never revealed before, including uncovered images of what sunspots look like. Citation: First image: Digital image. New Photos Of The Sun Reveal ‘Never-Before-Seen’ Features Of Sunspots And Solar Magnetism In Solar Atmosphere. Charles Poladian, 6 Aug. 2013. Web. 27 June 2014. Second image: Image of sunspots on the sun. Digital image. Sunspots: A Brief History. Canadian Space Agency, 17 Apr. 2013. Web. 27 June 2014. Sunspots are darker, cooler areas on the surface of the Sun in a region called the photosphere. The photosphere of a huge object is the distance of a star’s outer shell from which light is spread. Sunspots are formed continuously as magnetic fields move through the Sun. Sunspots have two main regions. Sunspots are composed of one dark shade or shadow surrounded by a less-dark outer part. To be more specific, a very dark part in the middle is called the umbra, and a less dark outer part is called the penumbra. Take a look at a few images that reveal the umbra and penumbra of dark spots. To read and learn about an experiment that scientists are currently working on about sunspots, please feel free to return to the Astro-Journalist web page fairly soon. I hope you have enjoyed my very first blog post. To learn more about sunspots you can visit the Sunspotters project. I hope you all enjoyed exploring teen blog posts about astronomy. I will continue to blog on the Astro-Journalist web page so please come back and visit soon. Thank you once again. 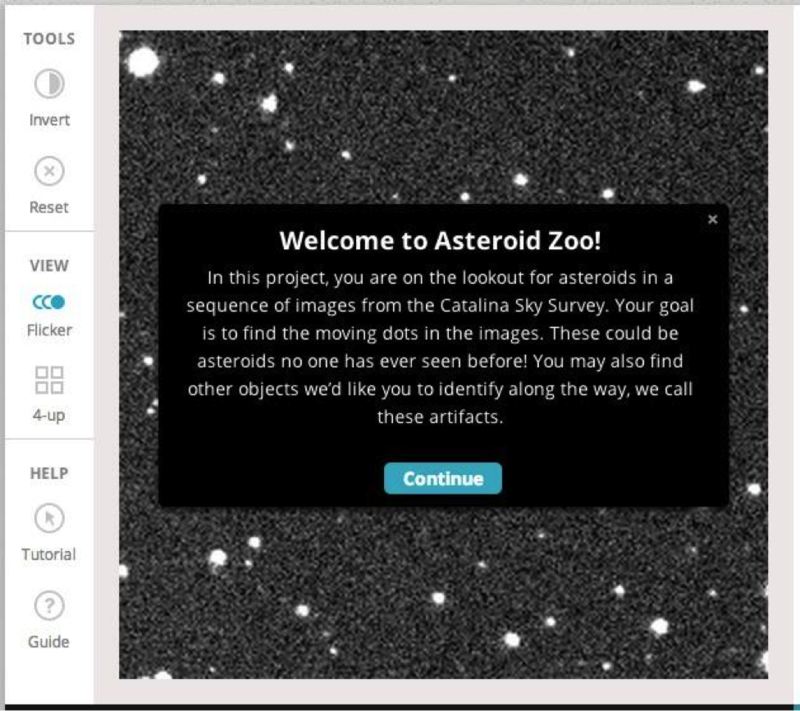 Zooniverse has presented an intellectual challenge to citizen scientists called Asteroid Zoo. Asteroid Zoo shows them pictures taken from the Catalina Sky Survey and asks them to help identify and classify asteroids. Citizen scientists are everyday people whose degree or experience is not accounted for when they help science by offering another pair of eyes. This project is currently happening today and can be found on the Zooniverse website, but did it ever cross your mind when scientists decided to explore asteroids? Let’s travel to the end of the 18th century when asteroids were first discovered. A group of scientists called themselves the “Celestial Police” and dedicated themselves to the search for the predicted planet between Mars and Jupiter. As the search continued, scientists and other astronomers instead discovered 4 ‘minor’ planets, which were actually asteroids. The asteroid discovery marked the beginning of people researching asteroids and wondering what their impact will do to planets. For instance, telescopes were created to only find new asteroids, primarily ones potentially harmful to Earth. In 1980, Physicist Luis Alvarez and his team pinned the dinosaur extinction on the invasion of asteroids. In 1994, plenty of telescopes witnessed the impact of comet Shoemaker-Levy 9 on Jupiter. It left scars on Jupiter’s surface and on the minds of the people watching. Just about twenty years later, in February 2013, an asteroid about 19 meters in diameter exploded over Russia. We were unaware of the asteroid’s incoming, but its entrance was definitely noticed. Based on the graph, the next asteroid of about 19-20 meters is predicted to impact Earth in the next 100 years. The graph below depicts how often an asteroid of various sizes is planned to hit Earth. An asteroid’s impact on Earth becomes rarer as its size gets larger. An asteroid just about 4 meters in diameter is predicted to hit every year, while an asteroid greater than or equal to 2,000 meter in diameter is predicted to hit every million to 100 millions years. The last “global catastrophic” asteroid was the one that took out the dinosaurs! Other than the worry associated with their impact, asteroids are in high demand for the information they might expose. They contain minerals that can give us clues on what the solar system is made of. Hopefully with your participation in Asteroid Zoo and with the help of many telescopes worldwide, we can soon piece together the clues and state the origins of our very own solar system. In the past few weeks, I have been exploring galaxies and learning a lot about them. To most, there is a common belief that there is only one kind of galaxy and that all galaxies are the same. This, I have learned, is not the case and that every galaxy is unique in its own way but these unique galaxies can be classified into their own categories to show that certain galaxies contain the same properties and can be generalized into a set “type” of galaxy. While I have been learning about galaxies, I have also been using a citizen science website called Galaxy Zoo in order to help astronomers categorize galaxies. This is done by analyzing an image of a galaxy and then answering questions that describe the image of the galaxy. While doing this, I was starting to realize that the galaxies are a series of different colors. Most of the time the galaxy was either an orange or an off-tone white. As I went through more and more images I started to realize that there were also galaxies that appeared to different shades of blue. To me, with a previous knowledge of how heat and energy works, I was beginning to think that the difference in color was a matter of energy and heat signals that was being given off of the galaxy. Through research and consulting one of the astronomers that helped develop Galaxy Zoo, I was able to create a hypothesis about the color of the galaxies into simply a matter of component stars and how old they are. Stars that make up the galaxy, as well as debris and dust surround a galaxy and eventually help create it into what we see in the image. All stars give off energy and heat, some look white because they are hot and some look red because they are cooler. 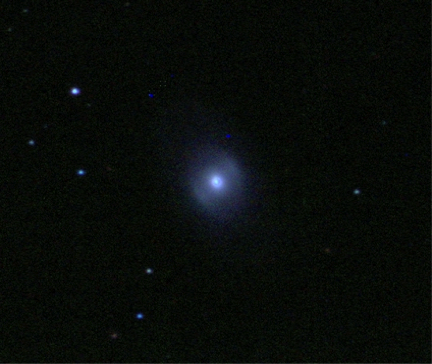 Red galaxies contain mostly these red stars, which are older, and blue galaxies contain mostly the white/blue stars which are younger. After writing about the wonders of Disk Detective, I’ve decided to try out the project myself. When I first signed in to Disk Detective, I was greeted by a tutorial window explaining how to contribute to the project. Users look at various candidate objects that DSS, 2MASS, and WISE have detected and took images of. 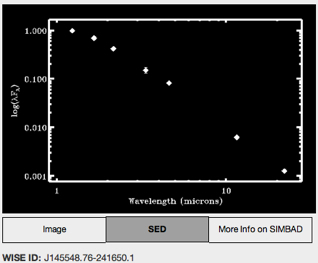 DSS (Digitized Sky Survey) takes images of objects in optical, 2MASS (Two Micron All-Sky Survey) takes images of objects in near-infrared, and WISE (Wide-field Infrared Survey Explorer) takes images in far-infrared. The user will then look at a slideshow of these images with optical images being shown first and the far-infrared images appearing last. After looking at the images as a series, options on the right-hand side will be highlighted for the user to select based on possible features the objects may possess. After exploring Disk Detective for a good bit, I decided to take note of ways users can become a pro at Disk Detective. When looking at images in Disk Detective some objects possess a cross-patterned artifact. I was wondering why do they have this cross-pattern and if users should categorize the objects as good candidates? 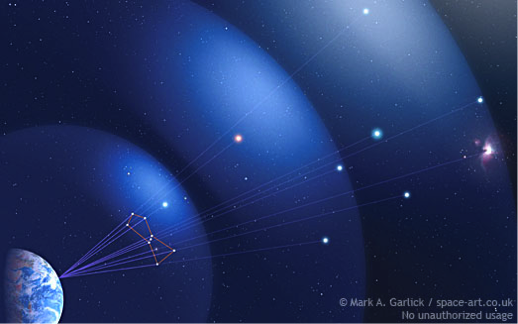 These cross-patterns are called diffraction spikes and the reason why they occur is because the light coming from the object is diffracted by the second mirror in the telescopes. Since the object has diffraction spikes, it’s a sign that the object is most likely a star because the closer an object is, the more apparent the object’s diffraction spikes are. So galaxies, which are far away from where we’re located, often have small or no apparent diffraction spikes while stars, which are relatively closer to us than most other objects, have well defined diffraction spikes. Although the star may appear to be out of proportion, it is perfectly fine and should be classified as having no oddities. In Disk Detective, one of the options given asks “Is the object round in DSS or 2MASS?” When I was looking at various candidate objects I would often have no trouble distinguishing whether or not the object looked like a circle or an ellipse. However, I would occasionally find ones where it was difficult to determine whether or not they were entirely rounded. Thankfully, it’s okay to list an object as round even if you’re not 100% sure it is because the images could have been distorted or stretched out of shape when being processed. If you’re still on the fence about the object’s eccentricity, you can post the object you’re looking at on the Disk Detective “Talk” page. Talk page allows users to post questions and share their discoveries for the citizen science project they’re working on; in this case they would write about Disk Detective. The “super-users” who analyze a large amount of objects, post any anomalies they’ve found while categorizing objects, look back at previously categorized objects, or even say what they believe the object is when looking at its data. The features of the Talk page don’t end there. Besides being able to discuss and post questions related to Disk Detective, users can look at the data of candidate objects. When you select an object while on the Talk page, there are three options below it: Image, SED, and SIMBAD. Image displays a slideshow of the object in various wavelengths of light, just like when you classify objects in Disk Detective. SED, or Spectral Energy Distribution, is a graph of the brightness of the objects at different wavelengths of light that the object emits. Objects that have a straight slope pointing downwards tend to be stars, while objects with slopes that are varied are likely celestial bodies such as galaxies and quasars. SIMBAD is a database of all the data gathered on an object and then archived. Looking objects up in SIMBAD allows users to determine the type of object they’re looking at, all the images taken of it, annotations about the object, and other information that users can investigate. With these tips and tracks at hand you should be able to conquer any obstacle you face while classifying and become an expert disk detective. Adler Zoo Nyverse: Greetings! 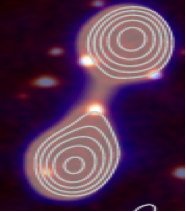 Welcome back to the second post of a 4 week mini-series dedicated to exploring Radio Galaxy Zoo. My name is Adler Zoo Nyverse, and I will be your host for these next couple of weeks. After an amazing introduction on difficult concepts such as gravity and escape velocity (not to mention the stellar explanation of the Radio Galaxy Zoo citizen science project), it is my pleasure to once again welcome Professor Hubble and Professor Kepler. Gentlemen, welcome, and thank you for being with us today. Adler Zoo Nyverse: Today we are going to do something a little different. Rather than explore a new concept, today we will taking questions from the audience and having you answer them. Does that sound alright? Adler Zoo Nyverse: Excellent! Our first question comes from Mr. Dark Matter who unfortunately could not be located. Why does it look like some black holes appear to have one jet while others have two? P. Hubble: However, Mr. Dark Matter does pose an interesting question. 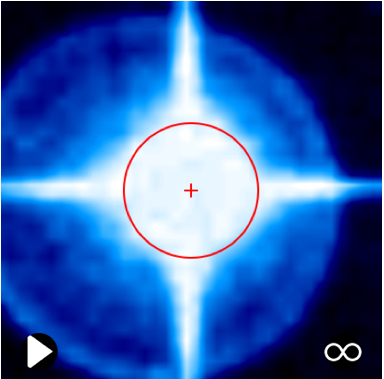 Perspective is an important factor when classifying black holes and even more so as you look at radio and infrared images on the Zooniverse site. It is important to remember that one must consider looking at things from all perspectives. P. Hubble: For some of the images on the Zooniverse site, you are staring at the galaxy face-on and thus, you only see the top jet. However, having seen the artist’s illustration, you know that there are always two jets. Adler Zoo Nyverse: Why that point actually leads us to our next question! Ms. Chandra, please enlighten us. 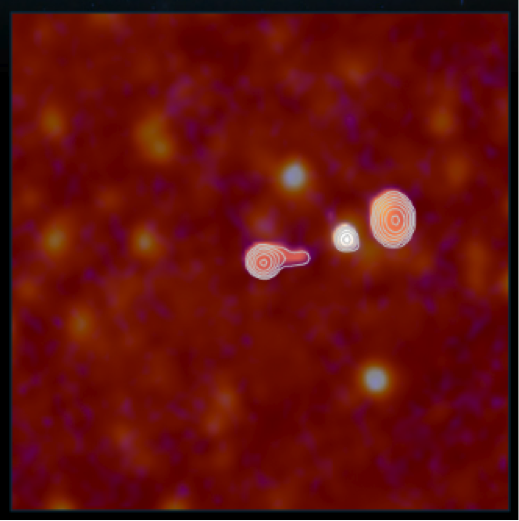 Ms. Chandra: While I was hunting for black holes on the Radio Galaxy Zoo site, an interesting question struck me: the galaxies that hosted black holes and jets seemed like they were relatively close to one another. Then I began to wonder whether or not the black holes could affect each other’s properties. I know I could have used the Talk page but I wanted ask you smart scientists. 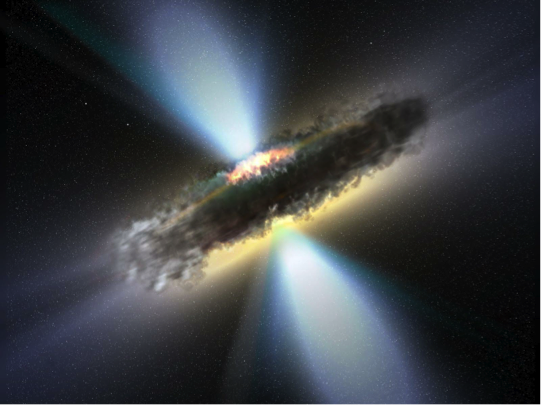 I know that galaxies with black holes must be far away from each other… right? P. Kepler: You are correct. The galaxies and their central black holes actually are far apart. You must remember that images we see are in 2D. Because images are in 2D, the third dimension is lost when you are looking at the picture. This figure below, for example, shows that constellations are formed from stars that sit at different distances from each other, as opposed to stars that are the same distance from the Earth. So the stars in a constellation look much closer to each other than they really are, it’s the same for these galaxies. Ms. Chandra: Wait what about my question? 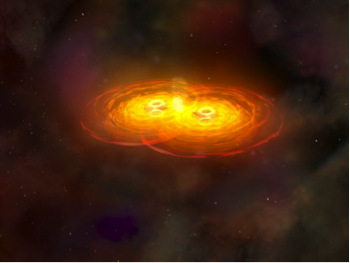 I saw this a picture of a “cluster” of black holes. So besides for the fact that these galaxies could all sit at different distances from Earth, is also important to remember that when an image of Radio Galaxy Zoo is taken, the image encompasses a huge distance. This distance is much much larger than what you might think. So while, in the image above, it looks like the three black holes are relatively close to each other, they are very far apart. And even if the galaxies were the same radial distance from the Earth, the image’s width covers a vast distance, so even a small distance on the image scales up to a prodigious distance in space. For example, the distance to most of the galaxies in the images used in the Radio Galaxy Zoo project is more than 10^22 miles away. 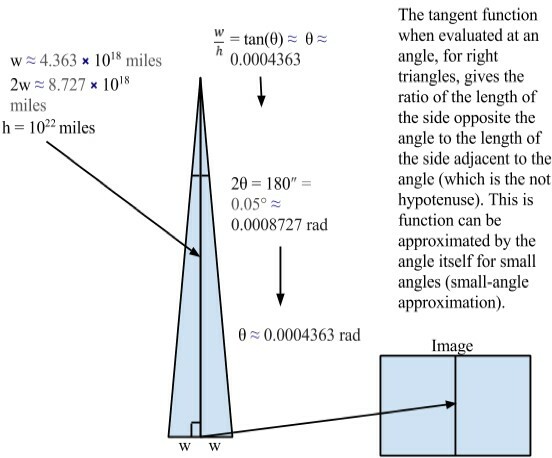 The angle of viewing in these images is about one twentieth of a degree. Using basic trigonometry, we can deduce that the width covered in these images is approximately 8.727 × 1018 miles. This is the same a a chain of about 50 milky ways or about 1011 times the distance between and the earth of the sun. Adler Zoo Nyverse: Now we have a question from little Timmy, who is an avid reader but is not able to be here with us today because it is past his bedtime. Timmy was wondering whether or not black holes had the superpower to combine into a super duper black hole. In the first box, the two black holes are definitely separated and apart, but as the images progress, you see how the gravitational pull of each black hole pulls the latter closer and closer, and the spirals begin to form, as they get caught in each other’s gravitational orbit. The black holes begin to absorb the stars and gas and by doing so, they exert frictional force, which is a force that resists the relative motion of two materials sliding against each other. By doing so, this force takes away energy from the separate orbital motion between the two black holes, and thus the distance between the two black holes decreases. Eventually the two bodies merge and become one as the distance between them decreases. Adler Zoo Nyverse: I would like to thank all you inquisitive readers for these wonderful questions. In our next installment, expect more clever questions, more excitement, and the continuing of a journey through Radio Galaxy Zoo.